Located in the Diagonal Avenue, one of the main avenues of Barcelona, with splendid panoramic views over the city and the sea. In a commercial and business district and well-connected to the airport and the center of the city. 412 completely equipped rooms (375 double deluxe rooms and 37 suites. 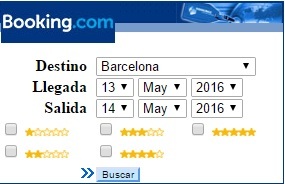 Click here for full description of The Hotel Rey Juan Carlos in Barcelona. Paseo de Gracia 68, Barcelona 08008, Spain. The Majestic Hotel in Barcelona is centrally located in Paseo de Gracia, a street which shows modernist Catalan architechture at its best (Casa Battlo or the Pedrera), including buildings designed by Antonion Gaudi. Another advantage of this location is that it´s in a great shopping area including international designer shops. It´s also very near the Ramblas and the Gothic Barrio, both of which can be reached on foot. The Hotel, with its neoclassical façade, has been recently renovated. It´s traditional and welcoming and also modern and comfortable and has been given the 5 star Diamond Award. It has a luxury 5 star restaurant also awarded 1 Michelin star - The Dromela Restaurant famous for its sophisticated gastronomy is considered one of the best in the Catalan capital. Facing the Mediterranean, this hotel has become one of the symbols of Barcelona since the Olympic Games were held in the city. A modern hotel belonging to the prestigious Ritz-Carlton Hotel Company, located in one of the Olympic towers - with its 45 floors - it offers one of the best views of the city and also the sea. If you want to stay near enough Barcelona to go and see the sights on a day trip, but want to avoid the hustle and bustle of a major city, then you could try the Parador at Aiguablava, Begur. 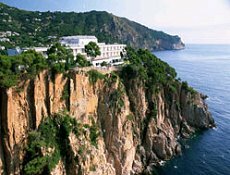 Aiguablava Parador (click on link for full description and review) is a delightful hotel, set a cliff overlooking the dramatic blue sea and craggy rocks of the Costa Brava.